Today I'd like to introduce you to another of the characters in Immagica. Lex is the protector and keeper of the Eye. We don't get to meet him until about half way through the story, but he manages to steal some of the lime light, and Rosaline's heart. Career: Keeper and Protector of the Eye. Biography: Lex’s history is unknown. Age: He looks around 17. Body Type: Tall and lanky. Complexion: Normal, but it’s hard to tell because Lex blushes a lot. Eyes: Lex’s eyes shift between hazel and green. 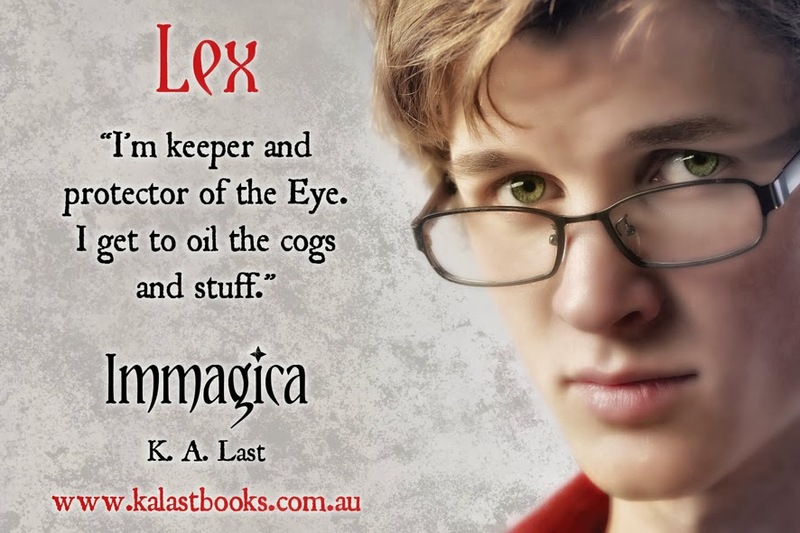 Clothing: Lex wears thick-rimmed glasses, a faded red T-shirt, jeans, and rubber thongs (flip-flops). Voice/Demeanour: Nervous and jittery. Lex is a bit of a geek, but he is also head-strong when he needs to be. He’s definitely not a push-over. Prejudices: Since the dragon launched his war on Immagica, Lex has loathed everything about him. Weaknesses: Thinking he isn’t able to leave the Eye. Hobbies: Reading, and cataloguing the books in the Eye, and oiling the cogs in the pupil. Weapon of choice: His knowledge. Talents: The ability to retain every piece of information that’s written in every one of the thousands of books inside the Eye.